Starr Church is a church that seeks to look beyond ourselves, and to bear fruits for a world in need. Below is a list of our current outreach activities in the community and our partners worldwide. Contact the church office at office@starrchurch.org if you would like to help. Starr Church, along with several churches in the Royal Oak and Berkley areas, host a rotating Warming Shelter for the homeless through the months of December through March. The churches involved open their doors (during their rotation) in the late evenings, offering a hot meal and a warm place to sleep. In the morning, the guests receive breakfast, a sack lunch, and a ride to work if needed. Each winter, we host a Coffee House Concert to raise funds for the warming shelter. It’s a great event featuring a variety of local bands. Get together a group of your friends and come support us! Sundays: AA Meeting in the Park, from 1-4 p.m. at Memorial Park in Royal Oak (13 Mile and Woodward). Beginning in October, the group meets at Starr Church. Tuesdays: Al-Anon meets at 9:30 a.m. To participate, a person must have a problem with a friend or loved one’s drinking. Before attending your first meeting, please call Laura at (248) 435-0968. Thursdays: Primary Purpose Men’s Group AA Meeting meets at 7 p.m. This group is open to men who have the desire to quit drinking. Questions? Call Tom at (248) 219-9993. Join us at 10 a.m. on the fourth Tuesday of each month as we knit, crochet and create items for those in need in our community. 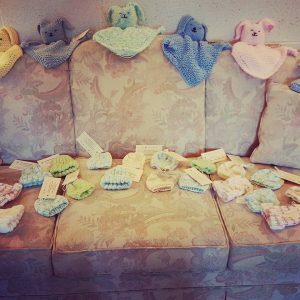 We are making prayer shawls, baby blankets, infant caps and more! Whether you have beginner or advanced skills, we can use your help! Please stop in for prayer and fellowship. Contact Janie Castle at janiecastle@aol.com for more information. Starr proudly supports Steve and Margie Doty, children of our church who are working to translate God’s Word into native languages to reach the world for Christ. To give to Wycliffe Bible Translation, click here. In memory of Diane Cole, and in honor of of her beloved Memphis, we continue to collect new and gently-used backpacks to be distributed during next winter’s Warming Shelter. Email the church office at office@starrchurch.org, or call the office at 248-288-3230 to arrange a drop-off. Thank you!